Three Brand-New Interviews with Nomura and Team! I just spent TWO AND A HALF HOURS, kthx, cleaning up these three interviews that have been floating around from Famitsu. Please do go take a look--there's lots of great new info to be found here. Does anyone have any pictures of the new enemy? I haven't seen it yet. Well now we know that it isn't Namine who is the 14 Organization member. Well thanks Oathy for translating this, I haven't seen this yet so It helped me out. It's in one of the older screens ofTerra at the Cinderella world. 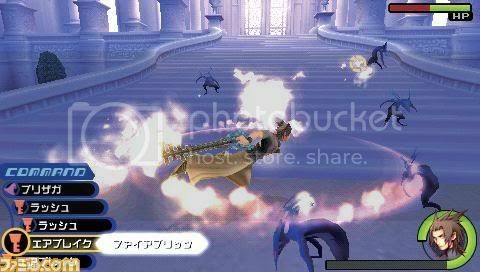 From the sound of it, it seems like we're going to get to play as Aqua. Yay!!!! But thanks for translating it!! Thanks Oathy for the translations. Cant wait for the new games!! I wounder what the surprise worlds are going to be? Theory time: Terra's scenario has an FFX-ish intro with Terra, years later, moping and angsting over Ven and Aqua and, begins telling the events of BBS from his POV. And when he's done, battle with Sora in KH2FM. Yeah, just a random thought, <.<. Woo! This is awesome. BBS sounds even more awesome. 358/2 sounds a lot better now[not that I didn't want it before] and Coded sounds like it might just be more important than we think. So what Concole is it gonna be on?